Gerry Conlon and John Sherman, Australia, visiting Fr Paddy at Inchicore in June 2017. The funeral mass and burial of Fr Paddy Dwyer took place on the 28th of December 2018 in the House of Retreat, Inchicore, Dublin. Many fellow Oblates, family members, House Staff, nursing and Caring Staff and local parishioners filled the Oratory. I was privileged to be among them. It was also very appropriate that two of Paddy’s ex pupils from Iona College in Queensland, Australia were also there. 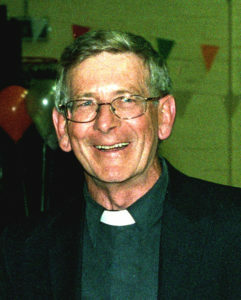 Paddy had spent most of his priestly ministry teaching in Australia. He was rector and prinicipal at Iona College and also at Mazenod College in Western Australia. Fr Oliver Barry, Provincial, Fr Brian de Burca, Parish Priest, and Fr Willie Fitzpatrick, Superior, made sure that the funeral Mass was a very happy celebration of Paddy’s life and ministry. He was a very compassionate, talented pastor, teacher, friend and sportsman. Many tributes were made to his life and lovely personality, not only by Brian, but there was also a moving tribute sent by an ex pupil and friend of Paddy’s who is now an Auxiliary Bishop in Australia. A colleague and friend, Fr Paddy Moroney OMI, sent another lovely tribute outlining the life and ministry of Paddy in Australia. When Paddy retired to Ireland due to ill health I was lucky to be reunited with him and to be able to spend quality time with him, while that was possible. This was during his frequent visits to his mother’s hometown, Rosslare Harbour, where his brother Joe lives. Last Sunday, Joe paid a lovely tribute to Paddy after the Masses in Rosslare. He ended by having the congregation sing a favourite hymn of Paddy’s. Paddy had heard this hymn from the bells while growing up almost next door to the Oblate Church and Grotto, The Immaculate Heart of Mary Church in Inchicore. This hymn was most appropriate due to Paddy’s future vocation as an Oblate of Mary Immaculate. The hymn was “The Bells of the Angelus”. Fr Paddy Dwyer was one of four young Irish Oblates missioned to the Australian Province in the mid-sixties. It was an exciting time to be young missionaries, and it was wonderfulto be going to Australia just as new migrant families were flooding in from Europe. Some 1400 new citizens from Italy were on board the Italian migrant ship which took us onthat long journey. Our arrival coincided with the Australian Oblate Province’s decision to found three secondary colleges to help meet the educational needs of a rapidly growing young population. Paddy spent much of his ministry working with young people in these schools. He would, in time, become Rector/Principal of two of them, Iona College in Queensland and Mazenod College in Western Australia. His success in the Colleges stemmed from the marvellous rapport he established with students. Always approachable and gentle, they implicitly trusted him, not only as a popular teacher of senior English and literature, but as a compassionate, friendly and wise guide in the face of life’s challenges. Because of this trust, students could readily overlook his occasional forgetfulness and his sometimes frustrating lack of organisation! The other outstanding gift which endeared Paddy to students was his love and appreciation of sport. An excellent sportsman himself, he could turn his hand to any ball sport, and especially Australian cricket. His knowledge of sport was encyclopaedic and was matched by his interest and enthusiasm. He coached football, soccer, rugby and even Gaelic Football, here in Australia. Seldom a weekend went by that did not see him engaged with students in sport, either playing a game or taking them to matches. To see him in action in the colleges, whether in the classroom, as College Principal, or on the sports field, was to understand the affection and respect in which he was held by thousands of students over the years. About twenty years ago, Paddy was asked to take on the job of director at Rosie’s Youth Mission. “Rosies” is an Australian Oblate initiative for homeless young —and not so young — people on the streets of some of Australia’s major cities, including Melbourne and Brisbane and many smaller towns. On various nights of the week, in all kinds of weather, he and his young volunteers would park their Rosie’s Van in the city at night and become the friendly hands and faces serving food and drinks to people living on the streets. His friendliness, compassion and natural ability to reach out to everyone madehim a marvellous director of this ministry. ‘Rosies’ was followed by years of excellent work in parish ministry. 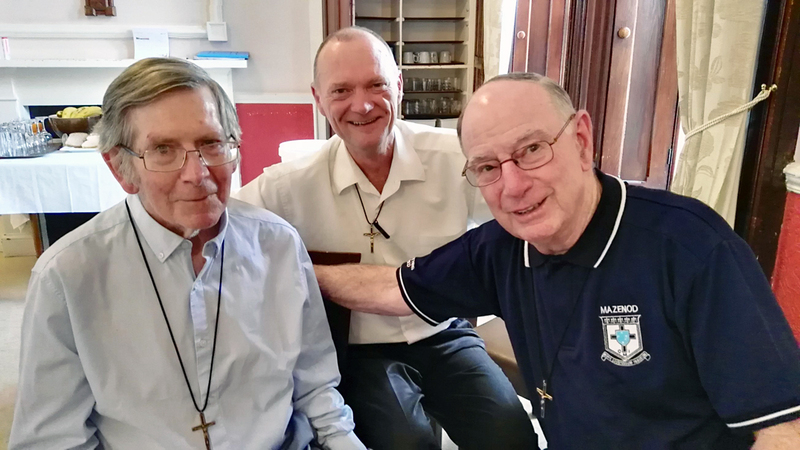 One of his Oblate brothers remembers Paddy’s “completely genuine interest in the person he was talking with… the warm smile that came from deep within him… He was the priest everyone wanted to talk to”. “He was the most lovable, loving and loved Oblate I have ever met”. God had showered many gifts on him, including a beautiful tenor voice and a willingness to use it for the enjoyment of others, qualities that made him a very welcome guest atgatherings, whether of Oblates, school groups or parishioners. News of Fr Pat’s call to God came as a great sadness for his fellow Oblates in Australia and in Ireland, and for his many friends and admirers. But we are above all grateful to God that his sufferings are now over and, most especially, for having had the privilege of living and working with him here in Australia for more than 50 years.